If you follow actress and social media maven Busy Philipps on Instagram, then you know she likes to work out. A lot. The star loves to post workout selfies, especially at her fave workout, LEKfit, but it turns out the "Cougar Town" alum exercises not for the likes or even her abs -- she does it for her mental health. "For me, getting the endorphins and the sweat every morning is part of what I think helps me keep [my anxiety] in check," she told Health magazine. Philipps also revealed some insights into how she manages to balance her life as an actress, mother, wife, and, of course, an Instagram star with over 1 million loyal followers. Here are some useful lifestyle tips that help keep the star in check. Exercise is a well-known effective stress reliever for the 40 million adults in the United States who also suffer from anxiety, according to the Anxiety and Depression Association of Anxiety. According to the interview, anxiety is something that Philipps has dealt with since childhood, including suffering from "racing thoughts, unable to get control of my thoughts, spinning out into paralysis of not being able to do anything and crying hysterically about it, or just feeling totally helpless." To help combat her anxiety, the actress has found relief in exercise, which has been proven that when done regularly, exercise can significantly reduce symptoms of anxiety. In fact, one study from the University of Georgia showed that "physical activities such as walking or weight lifting may turn out to be the best medicine that physicians can prescribe to help their patients feel less anxious." The "I Feel Pretty" star also likes to treat her anxiety with infrared sauna treatments. Infrared saunas warm the body, inducing hyperthermia, by emitting energy in the far-infrared range to heat the air up to about 140°F (60°C), which is lower than that of steam and dry saunas. Several studies have shown that infrared sauna therapy is an effective treatment for a wide range of medical conditions, including anxiety, by relaxing the body and boosting endorphins. Like most women, Philipps also suffers from body-image issues, which she says she helps manage by focusing on what her body is capable of doing rather than its imperfections, including her "ruined stomach" from childbirth. "I’ve had so many friends who have gone through fertility issues and have struggled to carry their own children—and here I am pregnant right away both times, with two beautiful, healthy kids," she tells Health. "And so what that they ruined my lower stomach?! Like, I’ll live, you know? I’m gonna wear this wrinkly skin with a lot of pride." Eliminating the negative self-talk in your head is a proven stress reducer, as well as helps those cope better with life&apos;s hurdles in addition to your strengthening your cardiovascular system. The actress makes sure to listen to her body, which means she knows when to rein it in or when to push herself out of her comfort zone. "I work out seven days most weeks, but I’m also not hard on myself," she tells the magazine. "If I wake up and I’m exhausted and I can’t f---ing do it, then I’ll give myself a break. I also think there’s a point where I know to push through, ’cause I’ll feel better after I do it." Listening to your body is a powerful step towards self-care, and body awareness has been proven to reduce stress and improve symptoms of anxiety and depression. 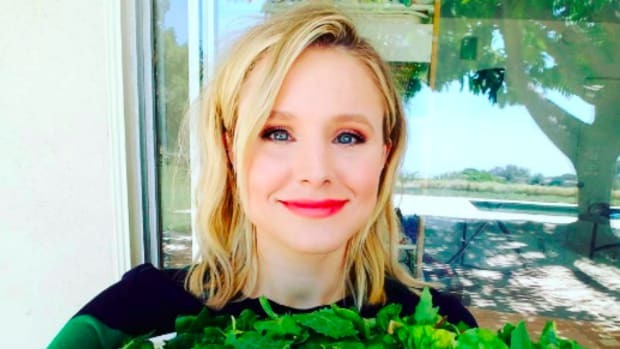 By putting her mental health and self-care first through exercise, infrared sauna treatments, and a positive mindset, the actress is able to tackle her "busy" schedule -- which is something we can all learn from.